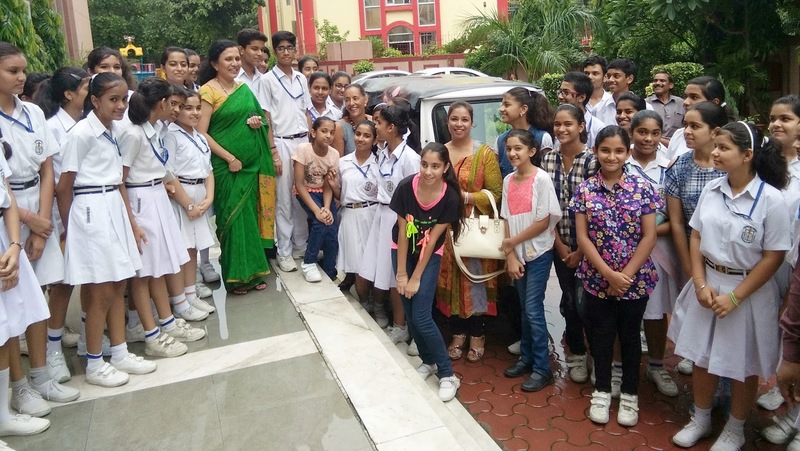 Mexican Ambassador, Ms Melba Pria visited N.K.Bagrodia Public School, Dwarka in her Official Vehicle –Autorickshaw bearing Maxican flag and Embassy number plate on the occasion of International Youth Day celebrations. The program commenced with the lighting of the ceremonial lamp and seeking God’s blessings. The students presented a series of cultural program which included Speech titled “Significance of Youth Day celebration”. A poem in Spanish was recited giving the message to the Youth for a developing nation. A power point presentation was shown by the students depicting the strong Culture and History of Mexico. Students presented a melodious group song highlighting the message of Global love and brotherhood. An International dance was showcased by the students which enthralled the audience. The Ambassador Ms Melba Pria had a heart to heart interaction with the students and discussed all the major issues of today’s time like Pollution, setting a goal in life, respecting girls, green earth, fitness etc. She was a source of great inspiration to the young minds through her Autorickshaw drive spreading the message and sharing to make a green and clean planet. She portrayed a true picture of being a Youth Icon. The Principal of the school gave the vote of thanks by telling the students to follow the guidelines given by her excellency. The program concluded with the national anthem of Mexico followed by the national anthem of India. The program was an inspiration to make today’s Youth responsible and an enlightened citizen of India.